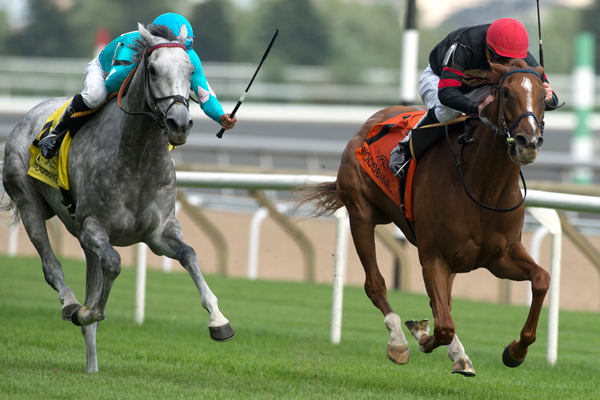 Involuntary and jockey Gary Boulanger prevailed in a photo finish over Happyness to win the $100,000 Flaming Page Stakes for fillies and mares three years old and up on Friday at Woodbine Racetrack. Involuntary and Happyness (Alan Garcia) tracked leader Belle de Nuit (Patrick Husbands), who galloped out to a commanding lead early in the 1-1/2 mile turf event. As the pacesetter began to tire and back through the field heading to the final turn, Involuntary took command with Happyness looming to her outside and ready for a stretch duel. Those two fillies duked it out in front of the grandstand with Involuntary ultimately holding off Happyness for the game victory in 2:29.38. Moonlight Sky (Rafael Hernandez) finished third. Bred in Kentucky by Dr. Catherine Wills and owned by Stronach Stables, the headstrong chestnut filly by City Zip out of Invariable earned the first win of her four-year-old campaign following top three finishes in the Dance Smartly and Nassau (Gr. 2) Stakes under the care of trainer Josie Carroll. Involuntary earned her fourth career win in 10 starts and boosted her bankroll over the $200,000 mark. Sent postward as the 4-5 favourite, Involuntary paid $3.80, $2.50, and $2.10 across the board. She combined with Happyness ($4.20, $2.60) for a 7-4 exactor worth $16.70. A 7-4-5 triactor (Moonlight Sky, $3.10 to show) paid $39.35 and a $1 superfecta of 7-4-5-2 (Giovanna Blues) returned $125.85.